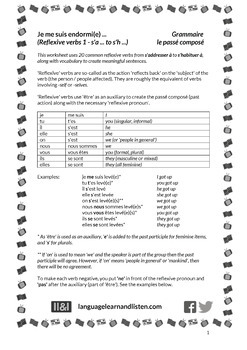 This worksheet deals with how to create the passé composé for 20 common reflexive verbs (from s'adresser à to s'habituer à). It also explains how to make these verbs negative. All the reflexive pronouns, auxiliaries and past participles are provided, along with additional vocabulary to create meaningful sentences. There are two exercises (French to English and English to French). Suitable for all levels of ability. Answers provided.